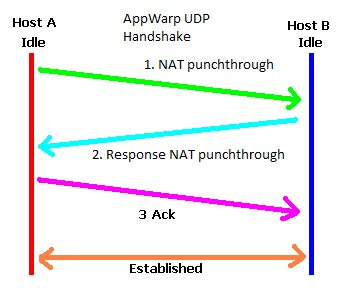 In our latest AppWarp SDK update, we have made UDP available for AS3. UDP is great for action based games in which the message exchange frequency is expected to be high and the inherent unreliability of the protocol is acceptable. With UDP, the OS doesn’t have the overhead of marshaling, buffering, tracking and acknowledging messages. Thus, UDP messages typically arrive at the destination application with a shorter delay than do TCP messages. This feature is available on Android, iOS and desktop AIR profiles. The SDK solution is designed in such a way that if your app is running in an environment where UDP will not work, the server will fallback to TCP and ensure that your app still receives the messages. We have used our Smiley Space shooter sample and modified it to use our UDP update API instead. Complete sample code is available on our git repo. This must be done once after the client is successfully connected with AppWarp cloud. 2. Send the update using the appropirate variant of send update API.